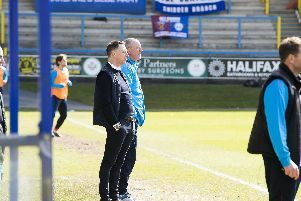 FC Halifax Town boss Billy Heath has told his players to give it everything they’ve got on the eve of the new National League season. Town host Aldershot on Saturday before a trip to Barrow on Tuesday in a tough first four days back in the fifth-tier for The Shaymen. Halifax aren’t expected to repeat their miraculous play-off finish from the last time they were promoted into the National League under Neil Aspin in 2013-14. But some astute signings, such as goalkeeper Sam Johnson and defender Martin Riley, should mean Town hold their own in the division. When asked what were the best qualities of his squad, the Town boss said: “Our togetherness, organisation and work ethic. And finding a way to win at times. That’s what we had to do at times last season. “We know we’re not one of the big boys in the league so the pressure is off us in a way. “There’s always pressure to win every game you play but there’s a lot of clubs who’ve got bigger expectations than we do. “There’s an abundance of full-time clubs and an abundance of huge spending in the league so we’ve got to fight for everything and make sure we keep that togetherness. On Saturday’s season-opener, Heath said: “I would take 1-0 right now. it would be a great result. “I’m really glad we’re at home because it’s great for the fans to come back. “The last home game was behind-closed-doors which was disappointing for the fans so it’s nice for them and hopefully we can get the crowd back with us. “Everybody wants to get off to a good start and it’s always good to get that first win out of the way. “It will be a difficult test because they finished in the play-offs last season and they’re a good footballing side. “It’s a difficult start with Barrow on Tuesday too. That’s a difficult place to go.